See all the excitement of the Class posedowns and the Awards, together with the dramatic posedown for the Overall Mr. Britain title, deservedly won this year by blind star bodybuilder Ricky Welling. We interview new IFBB Pro Ricky immediately after the Show, and you also see the guest posers, Ernie Taylor and Peter “Elvis” Brown. Held in Nottingham, Britain’s best bodybuilders gathered to battle it out for the much sought after Pro cards, along with the prestige of the National titles. Each of the Class winners pose as well as the winner of the best poser award, Bruce Leader. 105 minutes of outstanding EFBB Best of British bodybuilding action! All photos by Tina Gallasch. See below for our COMPLETE CONTEST REPORT. The EFBB British Championships were held in the Royal Theatre, Nottingham on October 6th. This was the first of 5 events for us on the international end of year contest circuit, followed by the NABBA Universe, the Olympia week in Las Vegas, back to UK for the English GP, then the Dutch GP. Home to Australia for a month and then I will be back to Germany for the WFF Worlds on December 14th. The EFBB had 112 competitors this year and they battled it out over 13 classes for the various titles and Pro Cards. As usual the standard was extremely high. Special guest poser was the huge PETER ‘ELVIS’ BROWN, owner of the largest arms in Britain. In the OVER 90KG CLASS, this was RICKY WELLING’S year. Ricky has been blind since birth and is an inspiration the way he gives his all under difficult circumstances. He has to be helped on stage and it is hard to imagine all the other difficulties in training and competing at the top level as a blind athlete. Over the last few years Ricky has been close to winning his over 90kg class. This year he not only won it convincingly, thus gaining his Pro Card, he then came back moments later and won the overall title as well. In the victory interview Ricky told us that he has been competing with the EFBB since 1989, so it has been a long hard road to the top. 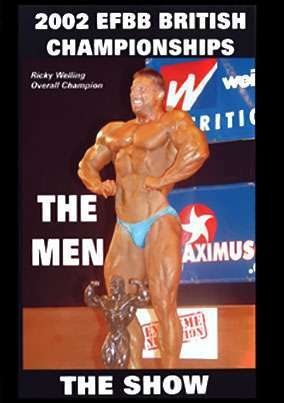 He subsequently made an impressive debut into the Pro ranks at the IFBB English GP one month later. In this over 90kg class, a ripped HAROLD MARILLIER was 2nd, with huge but not so ripped ZACK KHAN 3rd. In the UNDER 90KG CLASS, PAUL SUTTON was a clear winner with his very symmetrical physique, great calves and forceful posing. He also holds a class title from the NABBA Worlds and is a seasoned athlete. The UNDER 80KG CLASS was won by EFBB veteran PAUL THOMAS. Paul has won his class in the EFBB Britain on several previous occasions but in a different class. This time he took his Pro Card and also competed in the English GP several weeks later. He has a classic physique and looked most impressive in the overall posedown. But his lack of size was most noticeable on the Pro stage. The UNDER 70KG CLASS saw a narrow victory for ROB WILD over PETER ROCHE with sensational BRUCE LEADER in 3rd place. Bruce subsequently won the BEST PRESENTATION award. This guy has to be seen to be believed and rates as one of the best posers (performers) I have ever seen in bodybuilding. Check him out in the video when it is released early in 2003! There are 2 intermediate classes for guys – UNDER and OVER 80KGS. These classes are loosely speaking novice classes for up-and-coming guys who are not quite ready for the national level’s four separate weight classes. DAVID BAKER and MITCHELL GOSLING were both worthy class winners with big futures ahead of them. One step down again is the very popular FIRST TIMERS CLASS. In this very even class you often find a new, outstanding physique. Such was the case with brilliant winner RUSS PARKER. The Senior Men is one of my favourite classes as you get to see and compare guys you have watched for years. Real competitors such as CAVAN DERBY, BAZ BARDSLEY and GRAHAM PARK. But this time the winner was a symmetrical, shredded BRIAN CONNOLLY from Manchester. Last but not least, the four JUNIOR CLASS competitors. Low in numbers but high in quality with GEOFF BASTON being a clear and outstanding winner. Not a huge junior but a young guy with shape, definition and a quality that can be built on as he adds size and maturity. First up was the UNDER 52KG CLASS. The winner was SHELLEY HINE with a small but tight physique. Next was the UNDER 57KG CLASS and here it was a battle royal. Surprise packet was the return of SONIA WALKER, winner of the 1987 NABBA UNIVERSE FIGURE CLASS title. That was 15 years ago. However the old fire and silky posing skills were still there and better than ever. Sonia is a posing maestro, gliding from one pose to the next in a style all her own which reflects her dance background and great experience. At 52.5kg she was the lightest and leanest in the class and this shredded look probably cost her the class title. On the other hand, GAYNOR DAVIS was bigger and more chunky and looked the more traditional bodybuilder. Although Sonia was lean and ripped, she still looked like a figure class competitor and had to accept 2nd place to Gaynor, which she did most graciously. Finally the big women of the OVER 57KG CLASS. Seven of them battled it out with TERESKA BROWNING edging in front of the seasoned SARAH BRIDGES. The package of size, shape and muscularity displayed by Tereska both convinced the judges and her boyfriend who then came on stage and publicly proposed to her. Thankfully she accepted and then went on to take the overall title after a spirited posedown. Finally the FITNESS CLASS. I still don’t know why this class draws so few competitors. This year it was only three. I feel it will be a positive step when the EFBB adds a FIGURE CLASS for all the women who don’t have a gymnastics background or a desire to be large, more muscular type competitors. For the first time in the EFBB (to my knowledge) we saw a tie between 2 competitors who could not be separated, even after a countback from the judges. So equal first it was for NICOLE PITCHER and LYNSEY BEATTIE O’HEARNE. I was certainly not a judge because I only saw the whole event through my camera. However I personally felt that Nicole was the outstanding competitor in this class. For a complete set of results FROM THIS EVENT, see our RESULTS SECTION.